Hannah PowellOne of Bangor University’s elite athletes is celebrating a different kind of achievement this week and has swapped the medal podium for the graduation stage. 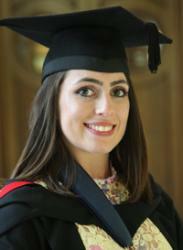 Hannah Powell, 24, originally from Rubery, Birmingham graduated with a BSc (Hons) Sport Science degree. Hannah began Olympic Weightlifting when she was 11 years old, and began training as a full-time athlete when she was 18. Over the years she reached a great standard of competing, and later moved to north Wales to live with her boyfriend, who is also involved in the sport. The next couple of years saw her work full-time alongside training and competing. The blow of a rejected job application due to a lack of the skills needed made Hannah consider her long-term future, and prompted her to apply to university through clearing. Already in love with north Wales, with access to world-class training facilities, the School of Sport, Health and Exercise Science’s excellent reputation was a bonus that instilled Hannah with confidence that she’d have a bright future with a job she would enjoy. “Since I have been living in north Wales, I have furthered my career in lifting and achieved my first senior international medals in the sport whilst also gaining a degree that will help me pursue a professional career in the future. Bangor University was a great support to my studies, and to my training through its Sport Scholarship scheme for elite athletes. “I was lucky to work as a casual sports assistant at the University’s sport centre, Canolfan Brailsford. It has really helped me get through university and I consider myself very lucky to have managed to secure a job here. As I was casual, I could choose when to take on more work and when to hold off, which was a real benefit whilst in education. “My final year research project was really interesting, I was supervised by Dr Neil Walsh and worked as part of a large team on an MOD project looking into the effects of Vitamin D on army recruits. It was a great experience to work out in the field as part of a real study with a great team of dedicated people. “The highlight of my time at University was winning my first international medals at the Commonwealth Championships (for Wales) and the World University Championships (for GB and Bangor University). I was supported well by the staff who allowed me to submit work early or allowed an extension to allow for me to manage my time between all my commitments. To achieve this whilst in the most important year of the course is something I am very pleased with. I have also met some great people here and it has opened up so many doors for the future. “It is a fantastic feeling to get to the end of this degree, I am happy with my overall grade and I know that this will really help me to progress in the future in whatever path I choose to go down next. “Right now I am focusing on getting myself to the Commonwealth Games in April 2018. I am working as many hours as I can get alongside my training and aim to try and enjoy the process of preparing for the competition without the added stress and expectations that can come with studying. I hope to go back to education to complete a Physiotherapy Masters course in 2018, so I will be busy trying to get voluntary experience in this area too.